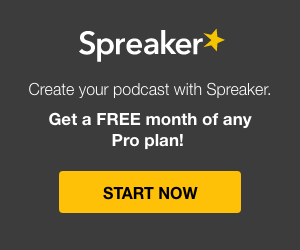 We've teamed up with Spreaker to offer you the best podcast platform available. Spreaker's wide range of tools cover every step of the podcasting process; from simple recording and broadcasting apps, to analytics on your audience and monetization via state-of-the-art dynamic preroll, midroll, and postroll ad insertion. Backed by support from Surfer, you get a winning combination. SurferNETWORK customers get a special discount, just use coupon code surfer or click the START NOW button on the banner. Podcasting is a great way to make your content portable - subscribers can be notified to download and save your program to listen to later on their device's podcast application or even have them download automatically. Record a podcast or broadcast live using apps available for mobile, desktop, and the web. Plus upload files and migrate content over using the RSS Importer. Distribute your podcast to social networks, Apple Podcasts, YouTube, and more. You can also schedule episodes, embed widgets, and order your own Mobile App. Basic analytics help you measure your popularity through play numbers. Going Pro unlocks more details like sources, geolocation, and demographics. Use podcasting to reach your listeners on-the-go who want to hear selected segments of your program material on their schedule. Podcast anything from your morning shows to special events to Swap & Shop. Podcasting can help faith-based organizations to spread the Word to their members on-the-go, or share the sounds of their choir throughout the week. We offer simple and inexpensive ways to create your own Internet radio station. Can you see yourself as a talk show host? You don't need a radio station - broadcast a talk show on the Internet instead. Record your episodes and add them to a podcast for listeners to take with them. You probably already have a variety of training material that your organization has created. We give you a way of making that content available to your geographically diverse and increasingly mobile employees - product demonstrations, training, replays of special company events or meetings - it couldn't be easier! Members of the academic community can reach out to students, parents and alumni with podcasts of special events that their audience can listen to many times over - sports events, plays, graduation, a special lecture series, and anything else you can think of! No matter how much content you have, we make it easy for you to share it on the Internet. You don't even need a web site. Podcasting allows you to reach a world-wide audience with downloadable recordings of your special performances.